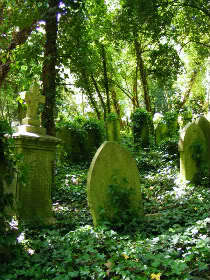 Highgate cemetery is the final resting place of many men and women related to the history of the humanist movement. As well, it is one of the most scenic areas in all of London. Highgate’s name dates back to the medieval period, when a toll gate was established to charge people coming in to London from the North. It was once a meadow but the town became established with the toll. The cemetery was built on the grounds of the estate of William Ashurst, MP and Lord Mayor of London. After his death it became a boy’s school and finally church grounds in 1832. It was Stephan Geary who would form the London Cemetery Company and plan the grounds of the cemetery which included the Egyptian Avenue and Terrace Catacombs. Due to the Victorian pomp surrounding death and funerals, Highgate would be the final resting place of many wealthy Victorians, with their graves and tombs reflecting the Gothic architectural tastes of the time. The grounds would maintain many of the trees associated with the Ashurst estate, making Highgate one of the most scenic locations in all of London. The Eastern half of the cemetery is the final resting place of many famous English and foreign men and women of distinction. The novelist Douglas Adams and polymath Jacob Bronowski have small and simple grave markers, whereas the memorial to Karl Marx dominates his surrounding avenue. Near Marx is the founder of social Darwinism and the man who coined the phrase, ‘Survival of the fittest’, Herbert Spencer. Stephan Geary would succumb to the last of London’s Cholera epidemics and laid to rest in Highgate. His grave would be covered in ivy for decades after World War Two and only rediscovered in 1970s. The closest tube is Archway but see Friends of Highgate for more information on visiting the cemetery.